The kids and adults packed 61 boxes that were sent to the distribution center and from there will go to children around the world. Thanks to all who helped! On Sunday, November 18 our Sunday School classes will work on filling shoe boxes with toys, hygiene items, school supplies etc. 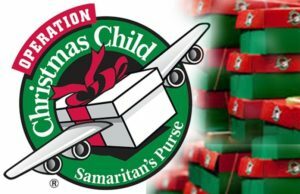 to be sent to Operation Christmas Child through Samaritan’s Purse. Our Purpose at Harvest Community is to Glorify God through worship in spirit and in truth. To Gather God’s family through outreach. To Grow in grace and knowledge of Jesus through discipleship. To Give back of ourselves what God has given through service. And to be Grafted to one another through Holy Spirit fellowship.